Jack, aka Batman, has made his return appearance to the CEM900! 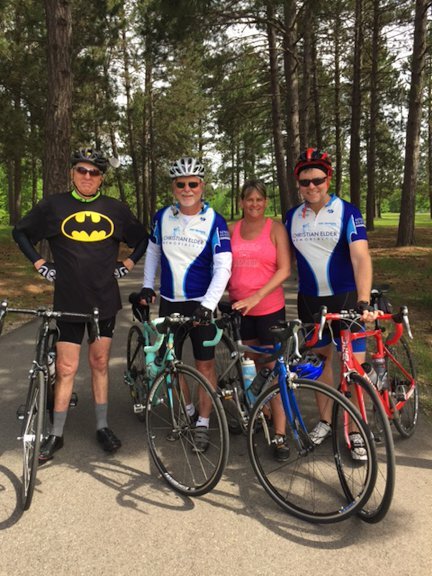 Doug and Zack referred to Jack as “Batman” regularly on last year’s ride, and Jack has fully embraced it, opting to wear a Batman t-shirt over his jersey for his inaugural 2017 ride! Unfortunately for us, Bob Porter had to cancel his scheduled CEM ride. Unlike Kyle, Bob had a legitimate last minute, business-related turn of events that led to the cancellation. Hopefully Bob will be able to join us for part of the 2018 CEM. On to the day’s events. We had a small thunderstorm overnight, and the morning was overcast, but non-threatening, as we enjoyed our morning coffee. Doug cooked sausage and eggs to order for us as a concerned Grand Rapids citizen pulled up, questioning why we were camped on the flat fairgrounds when we were supposed to be up the hill. OK, we get it! Next year we’ll remember…although John said our memories are short sometimes. We completed our campground cleanup and then walked our bikes to the entrance to the Mesabi Trail. After getting our trail passes and taking a few photos, John reminded Dennis to reset his bike computer, so that his average speed wouldn’t be diminished by the slow walk over, “because I know how you are” as John stated. No denials here; Dennis’ computer was already reset. 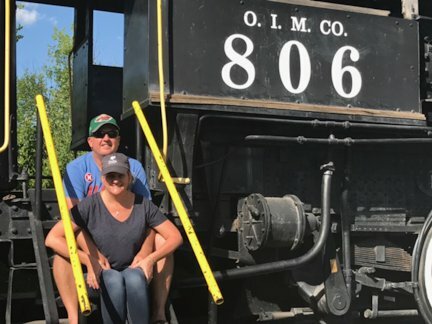 The first section of the Mesabi is very picturesque, rolling through forested areas, alongside lakes and through numerous small towns. 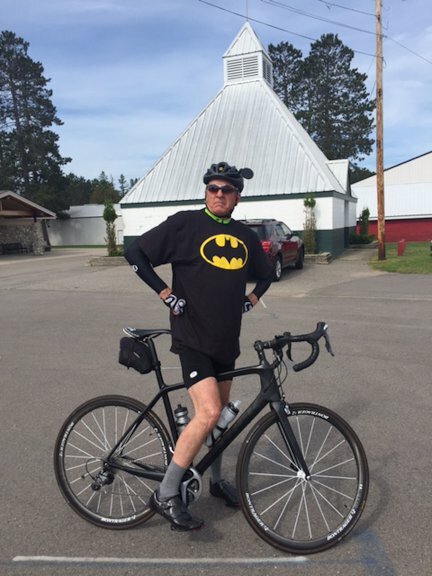 We enjoyed challenging climbs and nice downhill runs as we pulled into our first stop at the baseball field in Pengilly. 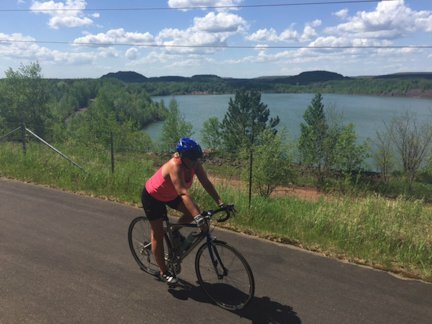 Next we continued on toward Hibbing, the day becoming increasingly warm as we rode. In Nashwauk, John made a detour when he started following the orange signs (for snowmobiles and ATV’s) rather than the bike trail signs. A friendly resident on her 3-wheeler guided John back to the Mesabi Trail, all the while John learning of her recent medical history. The rest of the ride was uneventful, but yet very spectacular as we made our way to the endpoint in Mountain Iron. To our surprise, we discovered that Mountain Iron is quite the Metropolis with shopping centers, coffee shops and alas, a Dairy Queen! Finally we were able to stop for a post-ride treat with our DQ gift cards provided by Kids ‘n Kinship staff. We proceeded to West Two Rivers Campground, where Doug and Anni set us up with a fabulous pork chops and homemade potato salad dinner. Doug started a campfire, fanning the flames with a cheap electric fan. Effective, but not nearly the cool factor that Justin’s jet fan had! We sat around the fire, listening to the Twins game on the radio. John made root beer floats, which Anni has been anticipating ever since she signed up as a support driver! What a great way to end Day 4 of the 2017 CEM900!